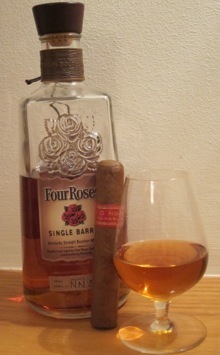 In September, I wrote about one of my favorite bourbons: Four Roses Small Batch. It’s a complex, 90-proof Kentucky whiskey that won’t break the bank. Recently, I visited my local liquor store to pick up more Small Batch. At least that was the plan until I saw Four Roses Single Barrel next to it. Only a few dollars more than the Small Batch at $37, the Single Barrel version (not to be confused with the Limited Edition Single Barrel) comes in at 100-proof. Master Distiller Jim Rutledge selects just one of Four Roses ten different bourbons for the Single Barrel. The result is a bourbon that’s complex, full-bodied, and spicy. The nose features caramelized sugar, burnt corn, and butter. On the palate, I found oak, toasted bread, roasted nut, and some pepper spice. The finish is long with nutmeg, cinnamon, and vanilla. Four Roses Single Barrel is not as sweet or smooth as the Small Batch, but it makes up for it with complexity and depth of flavor. This makes it an excellent candidate for pairing with a full-bodied smoke. Three new-ish smokes I particularly enjoyed with a few fingers of Four Roses Single Barrel were the Drew Estate Undercrown, Tatuaje Black Petite Lancero, and the 7-20-4 Londres. All in all, I might slightly prefer the Small Batch to the Single Barrel (especially when you consider that the $6 price difference can buy you a fine cigar to enjoy with it). Still, this is a good bourbon to enjoy with a cigar and one I plan on picking up from time to time. the aroma of butte? Had one of the Oliva/Padilla joint ventures yesterday. Might be the best rolled cigar I ever had, a thing of beauty. Taste was nice but for 15 bucks I'll have a Padron. Comments?